For the last year and half, I’ve been doing yoga as my primary form of exercise. Before that, I had been attending a once a week intensive yoga class for about a year. I set a goal for myself to go at least twice during the work week, and then on weekends, I attend my regular Saturday and Sunday classes. Various classes are run throughout the day, with the earliest starting at 6am. I don’t go to those very often. My rule of thumb is that I will go if I am already up (i.e. after early morning airport drop-offs), or if I wake up naturally in time and it is still early enough to go after I try to go back to sleep. This morning, I woke up, couldn’t go back to sleep so motivated myself to go to morning yoga. Maybe it was the early morning or the post workout coffee, but I started thinking about how yoga principles carryover to project management. And I’m not the only one. If the topic interests you, you can also read posts by Alison Sigmon, Workfront, Julie Miller, and Katy Martucci. Find your base – During most yoga practices, you spend the first few minutes centering yourself and setting your intention. Additionally, many yoga practices require an engagement of your core and grounding in focusing on your breath. In project management, you base is your foundation/methodology. It is the thing that helps you set the projection of the project, and you revisit as the project progresses. `Everybody can fly – This picture was taken at a 4 hour acro-yoga workshop during the time when I was only attending 1 yoga class a week. 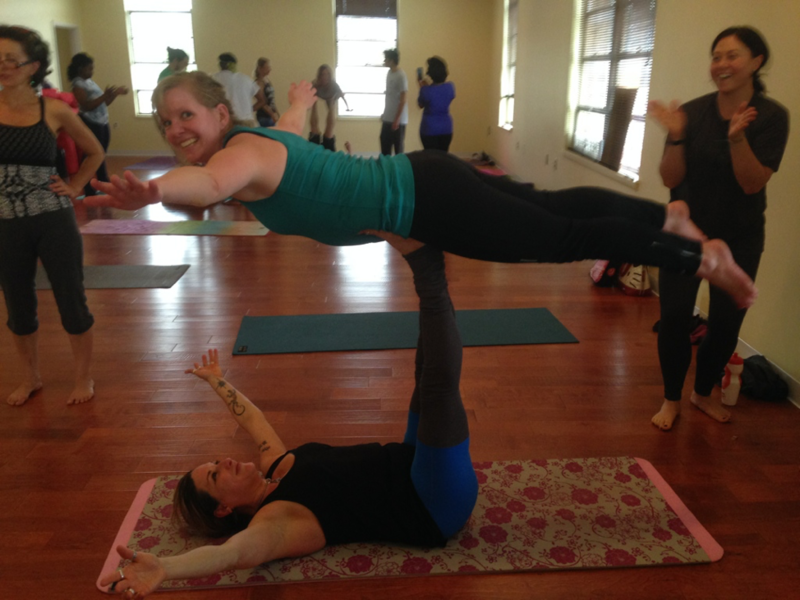 Our instructor, Ginny Loving, is holding the base of my super woman, but it is my core strength and balance allowing me to fly. Similar principles apply in project management. With a strong foundation, anyone can manage a project. The more you strengthen the core, the longer you can hold the pose, the easier it will be to get in and out of it. Each project you run provides that experience you need to manage the next one. The more projects you manage, the larger initiatives you can undertake, and the easier it will be to navigate the ebs and flows of the project. The devil is in the details – There are lots of different types of yoga. It’s important to consider the positions, chanting, intensity, heat, etc before you will find the one you enjoy (and this may change day to day). There are many different nuances to managing projects. You need to consider project goals, stakeholders & team management, risks, issues, self-imposed and external timelines, etc (and these too may change day to day). This is just a fun, little example of how project management is truly related to most things. Where have you made connections between your hobbies and your job?